How people approach a wholesome diet has changed dramatically over the decades. Today, many Americans see home cooking as an investment in health, but that leaves hurdles for many families who struggle with busy schedules and tight budgets. A few simple tips using frozen foods can help put any family on a path to healthier eating without breaking the bank. While many people desire to eat healthier, it’s just not happening as often or as easily as they’d like. MyPlate, the U.S. Department of Agriculture’s recommendations for balanced meals, illustrates how to build a healthy meal. Generally, the recommendation is that one half of your plate be composed of fruits and vegetables and the other half features grains and protein. However, many meals don’t follow these guidelines, and in 2011, Americans met MyPlate recommendations just seven days out of the year on average, according to NPD Group’s National Eating Trends database. Lack of time and higher cost are largely cited as top reasons why families aren’t eating as well as they could be. 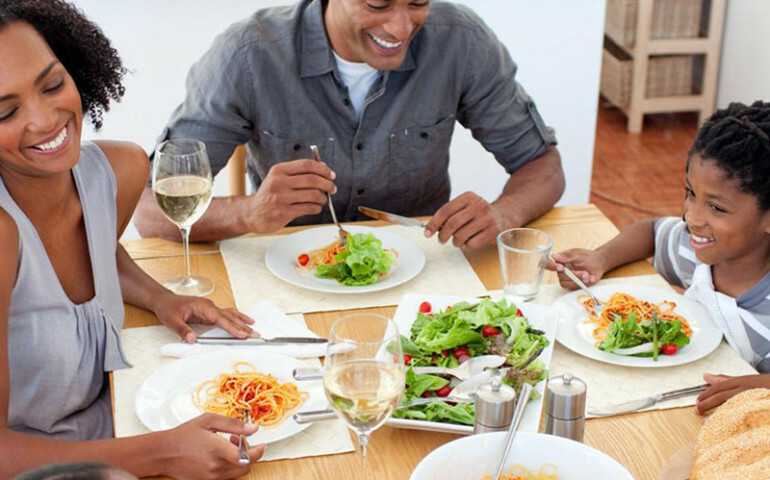 Fortunately, families can create balanced meals that fit into their busy schedules and budget. Buying fresh produce can be costly and time consuming. An affordable, convenient way to boost veggie intake is to stock the freezer with frozen fruits and vegetables. Contrary to what some may believe, frozen options often contain as many nutrients as fresh options because they are flash frozen when picked. This helps to preserve some/many nutrients during a key window when produce begins decomposing and losing nutritional value. Frozen and prepared food/dishes/entrees can help you to create low-cost, nutritious, delicious meals in a snap. Quality isn’t sacrificed when you shop the frozen aisle. One approach is to pair frozen prepared foods with fruits, vegetables, whole grains and low-fat dairy for simple meal planning. For example, take STOUFFER’S Lasagna with Meat and Sauce made from 100 percent pure beef, freshly made pasta, and vine-ripened tomatoes and pair it with steamed broccoli or a side salad for a wholesome meal with minimal effort and time. According to research conducted by the National Health and Nutrition Examination, people who reported eating frozen food took in 253 fewer calories per day, and consumed more essential nutrients like fiber, vitamin C and vitamin A, as compared to those who reported eating at quick service restaurants. Pizza night is a fun family tradition and frozen pizza is cost effective and can be easily prepared at home. DIGIORNO pizzeria! Pizza Primo Pepperoni can help you to create a low-cost, nutritious meal at home without sacrificing quality. Pair with a steamed vegetable or a side salad for a quick, affordable and wholesome meal. Bonus tip: You don’t have to be a full-fledged green thumb to grow fresh herbs and vegetables and add pizzazz to your pizza. Start a container garden on your deck and with a small investment of time and money, you can have fresh herbs to turn your regular cheese pizza into a tomato and basil delicacy. Great healthy options to plant in a container garden include tomatoes, basil, kale, lettuce, peppers, carrots and rosemary.